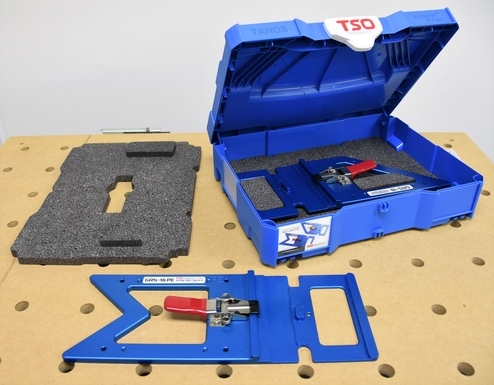 GRS-16 and GRS-16 PE Guide Rail Square Combination Set with Systainer and Foam Pac Inserts - TSO Products LLC. Free shipping to the 48 United States! Introducing the Newest GRS-16 & GRS-16 PE Combo Set that includes our own custom branded TSO Products Systainer. Enjoy special savings when you purchase both the GRS-16 and GRS-16 PE as a combination set, now available with our custom branded Systainer and Foam Pac Inserts to make it easier than ever to store and transport your Guide Rail Squares. The GRS-16 and GRS-16 PE are designed to make it much faster to achieve dead square cuts with your FESTOOL, MAKITA or TRITON track saw. Keep one in the truck and one in the shop, or use both guide rails at the same time to square either ends of longer guide rails. Before the GRS-16 family, accessories for squaring up your track saw guide rail relied on the loose-tolerance T-slot found on just about every guide rail. To overcome this inherent inaccuracy, you had to rely on a separate reference square, plus a combination of loose parts like T-bars, hex bolts, knobs or wingnuts. No longer! The patent-pending GRS-16 and GRS-16 PE are completely self-contained and self-aligning, thanks to an innovative, high strength integral draw latch mechanism. Simply slide the square onto your guide rail, lock the draw latch, and you're done. Five seconds to square. Accurate cuts with your track saw often require using a screw or quick clamp. 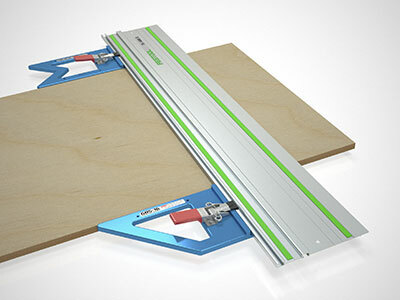 For this reason, we've designed notches in both reference edges of the GRS-16 PE to accommodate popular clamps like the Festool Screw Clamp or Quick Clamp. The GRS-16 and GRS-16 PE are precision CNC machined from a single piece of 6061-T6 aluminum and then anodized for a non-marring, high durability finish. The high-strength draw latch is built from stainless steel—to resist rust and pitting over time—and features a resilient, grippy, non-marring coating on the latch hook. Despite its high clamping strength, a comfort coating on the latch handle makes it easy to generate the leverage necessary to engage, release or reposition the square along your length of track. Both the GRS-16 and GRS-16 PE are made in the United States, and come with our lifetime warranty. Introductory video of the GRS-16. Introductory video of the GRS-16 PE. FESTOOL and Systainer are a Trademark of FESTOOL Tool Technic Tanos. We stand by the GRS-16 with a lifetime warranty!